The autoimmune protocol diet is over, and I'm due to write a final post with my thoughts on it soon. But, spoiler alert, I didn't get the results I hoped for. I will go into more detail on my round up post, but in a nutsehll I am currently in the foetal position on the couch with stabbing pains in my stomach. I left work early today and went to the doc, as Mario managed to make me freak and think I was actually suffering appendicitis! The doc felt my stomach, and said it didn't feel like it was that, so that eased that concern. 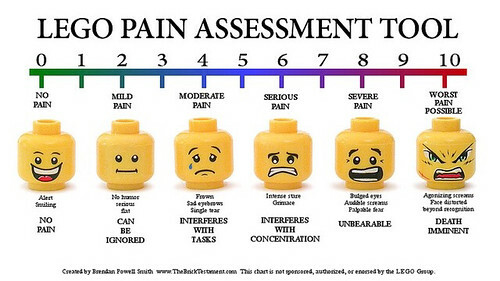 To put it scientifically, I am currently on the lego pain scale I'm at a 6, with some serious grimacing but occasionally jumping to the audible screams (more groans) of 8. It's making it very difficult to watch the super bowl replay! My doctor's current line of thought is whether I picked up something when I was in Lombok last year, as I did manage to get sick for a number of days while I was there. The fatigue started before that trip, but the rest of the other symptoms didn't. His rationale is that the earlier fatigue could also be related to work stress (which I had confirmed it was incredibly stressful last year). Tomorrow I will find myself back at QML early in the morning for blood tests, and I've also got to provide urine and stool samples as well. There was also talk of a colonoscopy pending the outcome of those tests. Joy. I had a bit of a melt down over the weekend, partially because I am incredibly frustrated by my health. I don't like waking up feeling like I'm ready to go straight to bed, or feeling like it's a mammoth effort to stay awake after 7pm. Or having the runs (like I've had for about a week and a half now). Or getting grumpy over minor things. Thankfully, this doctor is keen to get to the bottom of it, which is greatly relieving. He may even be worthy of keeping as a regular doctor – my other one is further away, and the random last bulk billing doctor I saw just said “you're fine” from my blood tests and didn't care any further than that. Funnily enough, the doc I saw tonight is one I used to see when I was a kid, although he didn't recognise me. I was quite shocked he was still working there after all this time! But back to the current matter, I will be seeing him again Friday after we get all the results of the test, and will take it from there. All I can say is I'm over it. I want energetic, happy Kel back now. It's not fun sitting on the couch anymore.